Tried and true, the DuroMax XP4400EH Generator comes equipped with a 7 HP engine that accepts high wattage loads with ease. Designed for safe and easy operation, the XP4400EH is easy to start and maintain. Both EPA and CARB approved, its dual fuel capabilities allow for maximum versatility in fuel management. 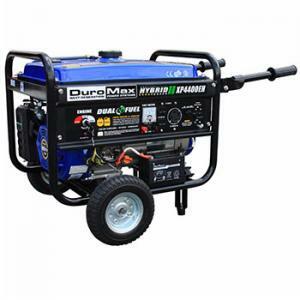 DuroMax Dual Fuel technology allows the freedom of operating your generator on gasoline or liquid propane. Enjoy safe, reliable power whenever and wherever you need it. Compared to gasoline, liquid propane is fuel efficient, less expensive and has a longer storage life.